What is Pre Marriage Counseling Sessions? Pre Marriage Counseling is a type of therapy that aides couples in preparing for marriage. These counseling sessions before marriage can help ensure that you and your husband-to-be or bride-to-be have a strong, healthy and spiritual relationship - giving you a much better chance of a for a stable, happy and satisfied marriage. Do you think counseling is just for people with problems? Think again. Pre marriage counseling will strengthen your chances of staying together if you learn the skills needed. With divorce so prevalent in this day and time, many couples don't have role models to follow. Counselors can step in and become your relationship experts. 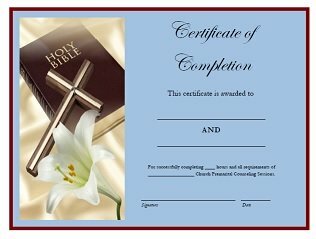 This certificate, in some states, can be used to help obtain your marriage license, and in some cases require you participate in these counseling sessions for pre marriage before getting marriage license. Pre marriage counseling is often offered through religious institutions, and some spiritual leaders or Pastors require this counseling before they agree to conduct their marriage ceremony. These pre marriage counseling sessions are also often performed and provided by licensed therapist known as marriage and family therapists. These graduates have graduate or postgraduate degrees and many of them choose to become credentialed by the American Association for Marriage and Family Therapy (AAMFT). Return to Certificates from Pre Marriage Counseling Sessions Certificate.